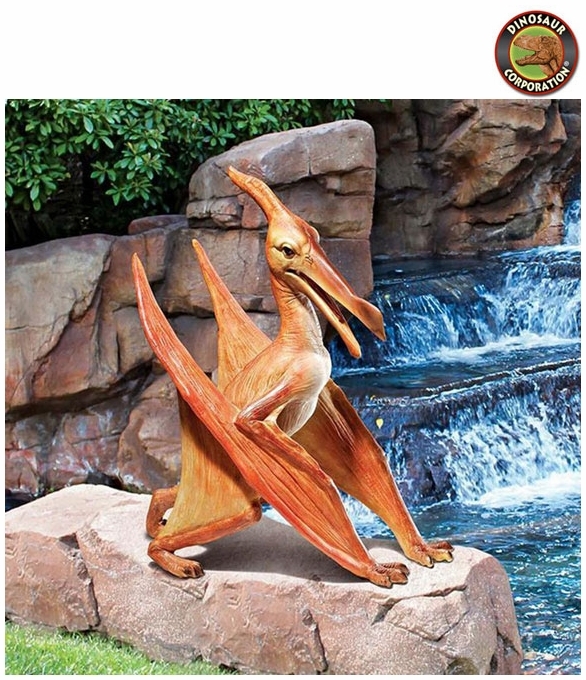 Home | STATUES | Pterodactyl Statue Dinosaur Garden Sculpture 14"
Pterodactyl Statue Dinosaur Garden Sculpture 14"
Museum quality realistically sculpted with prehistoric precision, scaled replica Pterodactyl dinosaur sculpture easily belongs in a class all on its own! Cretaceous Pterodactyl shook the scientific world up as the first designated flying reptile. This breathtaking prehistoric replica dinosaur statue is cast in quality designer resin, and hand-painted with powerfully convincing color and texture to be as faithful as possible to the form of its ancient species. Visitors will admire your creative garden style as our Pterodactyl statue makes a Mesozoic statement! Another museum quality dinosaur sculpture! ▪ Large Jurassic World T-rex Decorative Statue, 22"
▪ Jurassic Brachiosaurus Dinosaur Statue 40"